While it is difficult to say exactly what is going on here without seeing the actual student and her alignment in the poses, I can provide a good, educated guess. My guess would be based on the mechanics involved, so let’s take a look at the anatomy of the hamstrings. The hamstrings muscle group is made up of three muscles, the biceps femoris, semimembranosus, and semitendinosus. The hamstrings attachments give us our first clue of what is going on with our forward-folding yogi. The hamstrings are what we call “multi-joint muscles.” That is, they cross more than one joint. Taking a look at the picture of the left hamstrings we can see that they attach to the ischial tuberosity (sit bone), cross the hip joint, attach to the back of the femur (big thigh bone), cross the knee, and then attach to both leg bones, (tibia and fibula). We can see that the hamstrings can affect both the hip joint and the knee joint because the muscles pull across both joints. Taking some tension out of the hamstrings at the knees lets you flex more at the hips and vice versa. This is why bending the knees in a forward fold lets you fold more deeply. So, getting back to our question. What could be happening to our forward-folding yogi? My guess, based purely on anatomy, would be that while standing, our yogi is doing her forward fold mostly from her low back rather than flexing at the hips where it is intended. If the hips are not flexing as much, the hamstrings will have more room to lengthen at the knee, so the legs can be straightened. While sitting, the yogi would need to flex at the hips more to bring her body forward in order to not fall backward. Since the hips would now be flexed more, this would stretch out the hamstrings at the hip and there would be less length available at the knees, forcing them to bend. Based only on the anatomy, and assuming our yogi doesn’t have any other conditions affecting forward folding, this would be my guess as to what is happening. I would need to see the actual person to figure out this out for sure. However, this question is a great way to review hamstrings anatomy and how it affects movement at the hip and knees. More from Dr. Nolan Lee - check out his series on Yoga Asana for Hip Mobility. 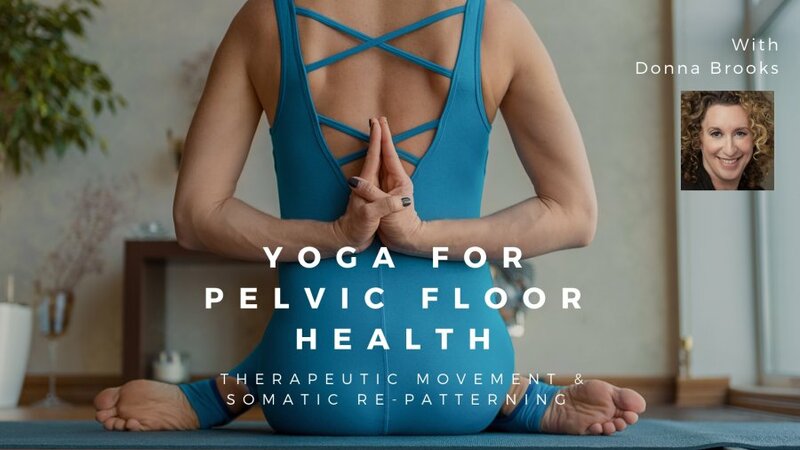 Also, study Yoga for Pelvic Floor Health-Therapeutic Movement and Somatic Repatterning - A YogaUOnline Course with Donna Brooks.